Education is one of the most valuable bequeaths that we can pass along to our next generation. It was hammered into my head when I was growing up that there is only one way out of poverty and that is education. I am doing ok following that advice, what is exciting to me with the advent of the internet is that education is no longer confined behind the walls of an institute. There are disruptions happening that could fundamentally change the dynamics of competitive advantage, productivity, understanding and knowledge dissemination in the entire world. I signed up with Khan Academy yesterday and watched about 40 minutes of Python Programmingvideos, I have to admit I have done my stint with coding and I am a geek. I thought the instructions were very clear, and I actually felt like I relearnt a lot of the basics very quickly. I think what Sal Khan is doing is fascinating and he is really defining his legacy. 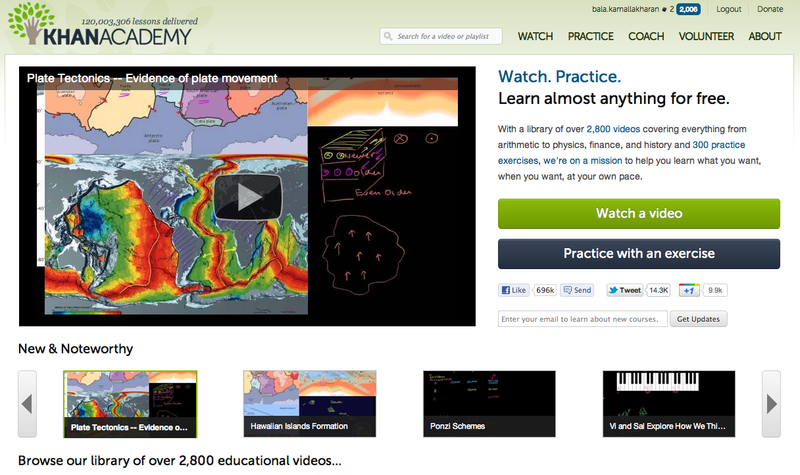 This is by no means an advertisement for Khan Academy, but the number of videos that is available in the library is close to 2800 thats a lot of learning in various subjects. I am going to continue my learning in the Python Programming and anything else that I want to learn. The freedom to choose your learning by watching a good teacher is a great motivator, it gives you confidence and the of course the learning. So, what are you going to learn?